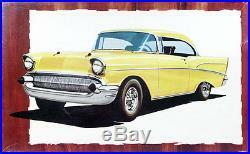 AMT Elegance Series 57 Chevy Bel Air Street Machine Lemon Peeler, #3217. The AMT Elegance Series was a limited issue series comprised of 6 different kits, all issued in 1967. They truly are rare today, as Ive had hundreds of thousands of old kits over the past 33 years at Hobby Heaven and Spotlight Hobbies, but Ive only ever come across two or three kits from this series until now. This 1/25 scale Lemon Peeler 57 Chevy street machine kit is molded in yellow, and it includes blue tinted blue glass, Keystone mags, and Firestone Supreme tires with red stripe on one side and blue stripe on the other (these were only found in a few kits). It also includes a can of AMT Translucent Pearl spray paint. The box is very good with great color, showing just a little wear. NOTE: We must declare full value on all foreign orders, no exceptions. Check out some of the other cool stuff. The item "AMT Elegance Series 57 Chevy Bel Air Street Machine Lemon Peeler" is in sale since Wednesday, November 25, 2015.